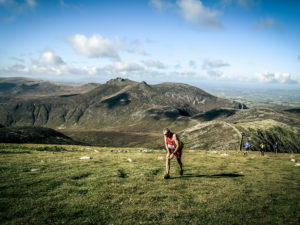 This short race over 3.9 miles with 340 metres of climb is the first mountain race of the year. As a short race over a fairly well defined route, it is suitable for athletes of all standards. to the north cairn of Sl Gullion and then along the ridge to the south cairn. Return by the same route. With a short route such as this, there are normally other athletes within sight so route finding is not a problem. If misty and you go off course then a good sense of direction is helpful but on Gullion any route will take you down off the mountain. In wet conditions the path along the top can be quite muddy. Wear shoes with as much grip as possible. In rain or high winds the race organiser may require a windproof top to be worn/carried. The hard part of navigation is finding the way to the start. See the web (or below) for directions – basically finding the highest point of the narrow road that runs across the north of the mountain. Aim to arrive at the start before 11:30 am. race, go west down the narrow access road, right at the tee junction, then immediately left. In only a couple of years within the last ten years has the fastest time been under 30 minutes. Relatively few ladies have finished in under 40 minutes, with Karen Alexander timed at 37:53 in 2009. On the Newry bypass, take the exit on the A25 to Camlough. Pass through Camlough and in 0.5 miles take the B30 to the left. After a bit less than a mile, with the lake on your left, there is a cross roads, with the B30 going both left and straight on. Take the left direction and climb 3/4 mile to the crest of a low pass. At the crest take a left turn up a narrow road for about 1.8 miles to a T junction. Turn left, with the start in about 1/3 mile, almost at the highest part of the road, at map reference 025229.